(6) they did not wash their hands and feet upon entering the Tabernacle. 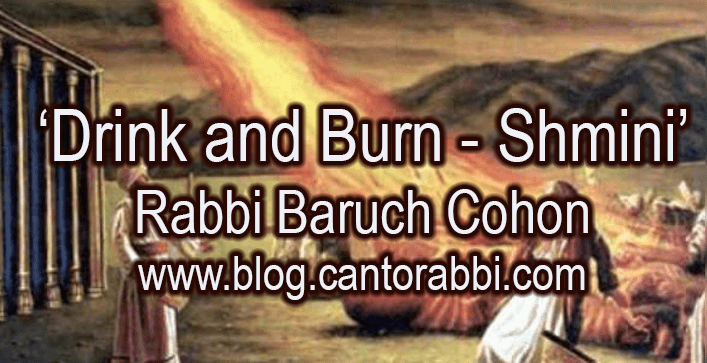 Rabbinical writers also note that the fire that consumed Nadav and Avihu did not burn their clothes, implying it was truly fire from heaven – lightning. Interesting suggestions, all. Questionable actions and their penalties are not confined to ancient times or to religious ceremony. When a pilot fails a breathalyzer test, minutes before he is to fly a passenger plane, he is grounded. In fact, airline rules require pilots to stay away from alcohol – not all the time, but for a certain definite period before and during flights. Our Torah provides a sacred precedent for those rules. After the shock of Nadav’s and Avihu’s death, Moses has to caution Aaron and his remaining sons not to drink wine or liquor “when they come into the Tent of Meeting.” In other words, don’t officiate while under the influence. What the Torah most definitely does not do, is ban alcoholic beverages completely. Not even for priests. No Prohibition law here. This distinction continued through Jewish history. Kiddush to this day involves a drink of wine. But note, in the synagogue the cantor chants the prayer and drinks the wine toward the end of the Sabbath or holiday evening service, when most of his officiating is over. And daytime Kiddush occurs after the service is finished. As for priests, Cohanim, they generally recite their benediction, their blessing of the people, during Musaf, the additional and concluding service of a festival morning. But there is an exception on Simchas Torah, the holiday of Rejoicing in the Torah. Many congregations accent that annual celebration by giving every man called to the Torah reading a schnapps. So on Simchas Torah the blessing of the Cohanim is moved to the Shakhris service – before Torah reading! And of course, since the reading of this secton in the synagogue closely follows Purim, with its accent on partying, we can appreciate the perils of overindulgence. No, we don’t prohibit alcohol, even for Cohanim. Any more than the airlines demand total sobriety from their pilots. What they – and the Torah – require, is good judgment. Take the time to sober up. For some of us, that sobering is a process of years. Those of us who experience dependence on alcohol or drugs usually discover that recovery can go on indefinitely. Our tradition provides for that too. Remember that the blessing over grape juice is exactly the same as the blessing over wine. That parallel goes for whiskey and coffee too. Hopefully, we made some progress since the days of Nadav and Avihu. Even without lightning. 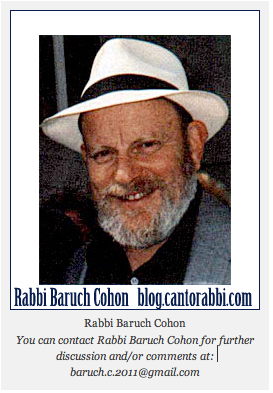 This entry was posted in Jewish Blogs. Bookmark the permalink.